All sorts of fashion designers are turning to dancers as their muses for forthcoming spring collections. Here's one of the inspirations, 3-year-old Lucy, who's fresh from twirling and pirouetting in her ballet class. 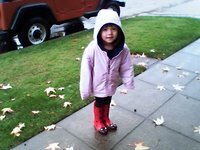 The preschooler can give trendoids a lesson in comfortable fashion by the way she paired a black bodysuit with bright red ladybug Wellies. Greta and I walked the three-quarter mile from her house to the community center where Lucy had her dance lesson. Carrying umbrellas to shield us from the drizzle, Greta and I were able to take a leisurely stroll and admire the Japanese maples, holly bushes and other verdant foliage growing in front of Queen Anne and Craftsman homes. After meeting Lucy and her dad, we walked to Cafe Besalu, which makes the most scrumptious croissants, danishes, schneckens and other pastries that require multiple layers of flour and butter. If I were a big enough of a francophile, I would move to Seattle just so that I can have breakfast at Besalu everyday that it is open. My only complaints are that there aren't enough tables to accommodate the patrons, who hover over occupied seats like famished vultures. What's more, diners' conversations and the kitchen clang bounce off the tile floors, metal roof and hard-topped tables. But the din certainly covers up the excited chatter from tykes like Greta and Lucy. 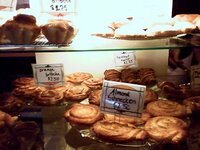 This is Besalu's pastry cabinet. Spending a weekend with two little kids can work up an appetite. 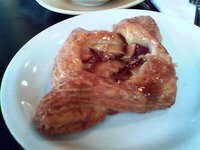 After a leek quiche made with goat cheese, I satisfied my sweet tooth with a plum danish seasoned with frangipane. My soy chai latte not only washed down the tasty delicacies but also fortified me with some caffeine and sugar to survive the afternoon's Tumble Bus birthday party. 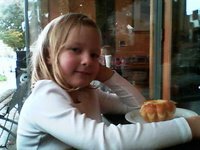 Greta had a cheese brioche. I was too far to capture the crumbs dusting her little lips. 0 Response to "Besalu Breakfast"